As carpenters love their cordless drills, so executive coaches and psychologists love their Johari windows. Developed in 1955 by Luft and Ingham and popularised by Charles Handy, the Johari window is used to help people better understand their relationship with self and others. The central idea is that as individuals we have blind spots that can be partly addressed by asking for feedback and reflections from those we frequently interact with. Similarly, we often put up facades or masks that hide key elements of our needs and personality. These hidden areas can be addressed through more self-disclosure which in turn can help build inter-personal trust and understanding. I think there are some fresh insights to be derived by adapting the Johari window to the strategic account management space. 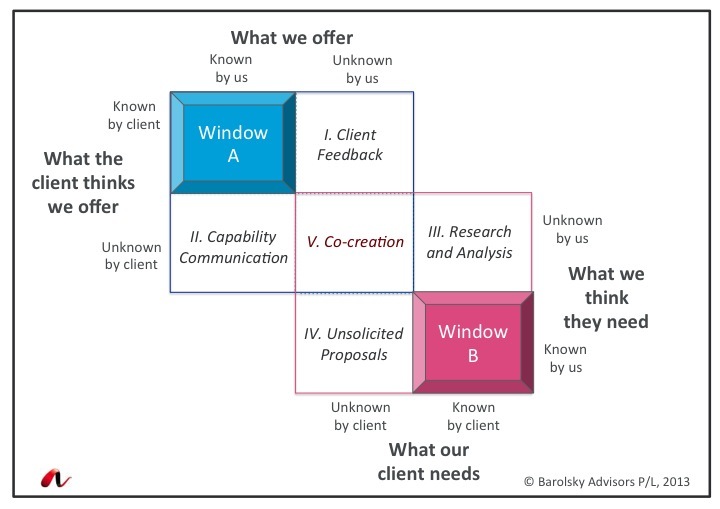 In my mind there are actually TWO windows that one can draw – one that centres on “What we offer” (Window A) and the second on “What our client needs” (Window B) – see graphic. Window A can be opened wider through (I) regular and effective client feedback and (II) various capability communication activities such as firm events, cross-selling and communication campaigns. Window B can be opened wider through (III) more intensive research and analysis into the client’s business. In other words using primary and secondary sources to identify how the client is seeking to compete, the nature of their strategic priorities and their key challenges and opportunities. Window B can also be extended by (IV) telling the client the things they don’t know, reveal their blind spots and inform them of new things that can add value to their business. An earlier Relationship Capital post on the power of unsolicited proposals explores this issue in depth. To me, the most interesting part of the Client Johari is the overlap between the two matrices – the unknown unknown space. I have labeled this the zone of Co-creation, but it could equally be called the zone of Rumsfeld. If you need an explanation please view this video of the former US Defence Secretary afflicted with foot in mouth disease. Why is this space of particular interest? Opportunities that emerge from window-windening strategies I, II, III and IV usually revolve around the selling and buying of existing, well-defined products and services. In many instances these products and services are similar to those offered by competing firms and can be hard to differentiate. In my view this is the next generation of strategic account management and it requires a different mindset and a different set of skills and processes to those used in I to IV. 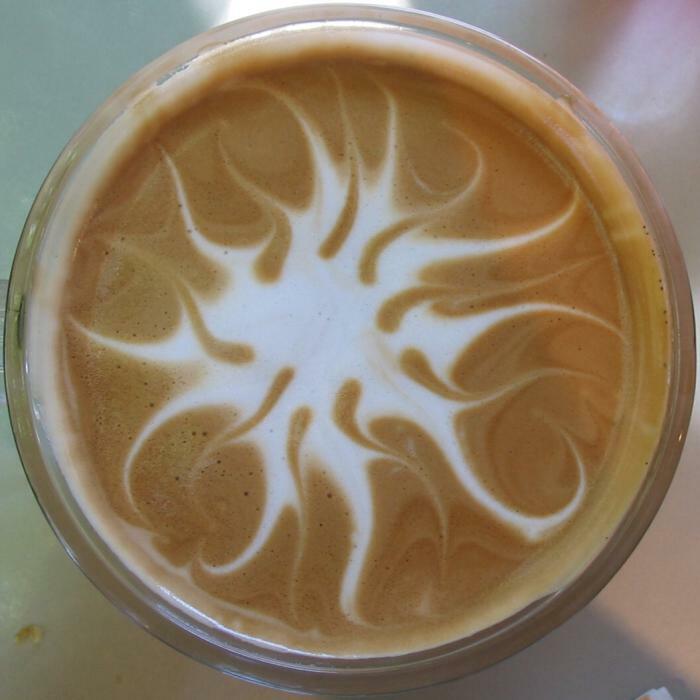 While there is a huge potential upside, the zone of Co-creation is inherently risky. It may force the firm to reveal its dirty linen and/or to expose people and practices that are sub-par or non-existent. Many senior service professionals may be severely challenged by the “grey” i.e. entering an area that they may not be perceived as the expert with all the answers. Despite the best of intentions, nothing new or fresh may emerge from the Co-creation process and the client many view it as complete waste of their time. There is also a risk of the client just not showing up, in other words, not willing to engage and invest in this type of dialogue. While there are these risks, with the right client and the right process, there are rich pickings in the unknown space. It doesn’t feel easy but that’s exactly why there are returns to first movers and those seeking to advance their strategic client relationships beyond the comfort zone. I’d commend client relationship managers to add the Client Johari to their toolkit. Not 100% sure it will earn the same status as cordless drills, but who knows? I will be presenting on this topic at a Beaton First Movers seminar on 24 and 25 July 2013, and with Julia Davenport of Energetics at the APSMA National Conference in September 2013.